On a normal day, our co-founder Prukalpa’s calendar looks like a complex mosaic of calls and meetings. The other day, she started off her morning with a couple of calls from home, one with a pharmaceutical company followed by one with an FMCG company. She then set off on an hour-long drive to Gurgaon to meet with a motorcycle company, followed by a call with a large intergovernmental organization on her drive back into Delhi. After four hiring interviews in the afternoon, she closed her day by talking to an analytics company. As an introvert, this sort of day is my worst nightmare. But it’s Prukalpa’s favorite part of her job. “I love sales. It puts me in front of our clients and our partners, where I can solve their problems,” she explained. If this sounds a bit weird, you’re not alone. To many people, sales is a negative word. It conjures the image of a slick salesperson trying to trick you into buying a product you don’t need. In fact, that’s how I thought about sales for the longest time. But SocialCops proved me wrong. At SocialCops, sales isn’t just about selling. It’s about problem-solving. When Prukalpa opens up a conversation, she doesn’t start with, “This is our platform, and this is what it can do. You should buy it.” In fact, she won’t even bring up our platform for a while. Instead, she starts every new conversation with a genuine desire to listen and learn about an organization’s problems. Often, using data is the solution to those problems, and that’s something that we can help with. But if something else will help them, Prukalpa tells them that. This sounds idealistic, but it’s legit. A state government once came to SocialCops and asked us to create a “Golden Record” — a database that stitched together all data about every person in the state. Our initial tests showed that the accuracy of this database would be very low. No matter how we transformed and validated the data, we likely wouldn’t even get to 50% accuracy. It would have been an incredibly valuable partnership, but we ended up saying no because we wouldn’t be solving their problem. Instead, we suggested that the government collect new data, which would help them build a “Golden Record” at far lower cost. This focus on problem-solving is both a blessing and a curse for the Sales Team. On the one hand, it builds amazing relationships. When our partners know that we’re trying to do what’s right for them, not what’s right for our bank account, they give us an incredible amount of trust. Even though we’re a bunch of 20-somethings, we’ve acted as advisors to some of India’s top government ministers, CEOs and philanthropic leaders. A great example of a SocialCops salesperson is Sowmya. After just ten months in the company, Sowmya is the master of all our government dashboards and solutions, which range from a Sustainable Development Goal tracker in Papua New Guinea to the DISHA Dashboard for every elected official in India. Sowmya was actually a corporate lawyer before she came to SocialCops. Done with a tiny part of her dying every day, she decided she wanted to help make better policies. She had absolutely no intention of doing sales; her image of sales was vacuum salesmen going door to door, saying “Please ma’am, buy this vacuum, I have to meet my targets.” But government sales was where she could make the greatest impact, so she gave it a try. Months later, she loves her ability to shape incredible government policies and improve people’s lives. Sowmya and Prukalpa aren’t traditional sales people. 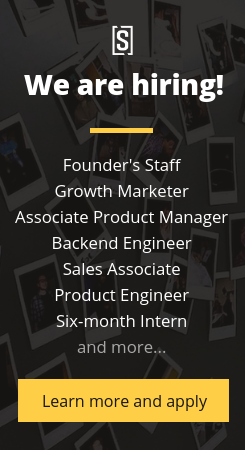 Neither of them has a background in sales, nor did they think of themselves as sales people before they joined SocialCops. Now they can’t imagine being in any other role. Our Sales Team’s favorite company value is “Problem First, Solution Second.” But what does it actually take to problem-solve for FMCG companies, rural non-profits and government ministers in the same day? “Problem First, Solution Second” is just one of our 6 company values. Learn what they are and how we try to live them every day. When Sowmya joined, she didn’t just have to learn about SocialCops and our platform. She had to learn about technology, data, the development space, how governments work, and how to make better government policies, all in a matter of months. She buckled down and got to work learning from everyone she could. Now she acts as an advisor to high-level ministers and speaks at UN SDG conferences about how data can be used for better policies. Coupled with learning is the ability to build trust. The problems we deal with and the solutions we create are complex, and we’re often given absurdly high-level briefs like “How do I solve the water problem in Delhi?” or “Help me track what’s happening in India.” Getting from these briefs to a better solution means getting close to our partners and digging into what’s going wrong and what they need. This sort of open collaboration just isn’t possible without our partners trusting that we genuinely want them to succeed. A great example of this is when we signed on to a massive government deployment last year. We were one of five or six partners, all working to make a new scheme roll out as effectively as possible. As we started digging into the data, we realized that people’s first interaction with the scheme was broken. This had nothing to do with us; it was actually someone else’s responsibility. But if that part of the process broke, the entire program would fail. Prukalpa stepped into the next meeting and raised the issue. “Hey,” she said, “I just want to bring something up. I wanted to understand the rationale behind this process, because I think there’s an issue. Why are we doing this in this way?” Far from being offended, the partners opened up and it built trust. For our first few years, most of our partnerships came through referrals. These didn’t need “selling”. They needed problem solving that would help us learn what to build. This was something our founding team was really good at, so we didn’t need a deep bench of salespeople. But now SocialCops is in a different position. We’re not learning what to build for, say, scheme monitoring anymore. We’ve done it four times over, learned what it takes to solve the problem, figured out a great solution, and scaled it up to massive heights. If we now bring in a salesperson, they can take this solution to the market and let it take off like a rocket ship. Think this sounds like you? We’re looking for talented problem-solvers and sales people across several sales positions. Check them out and apply on our Careers page!